At Maralinga, the British Government treated Aborigines, Australian servicemen and even its own troops as scientific guinea pigs. John Keane , whose father was there, looks at the dirty games that were played in the desert of South Australia. Beadell was the leader of a reconnaissance party that had been sent “scrub bashing” in southern Australia 50 years ago, in search of a permanent place to test Britain’s atomic weapons. The site he found and recommended was initially code-named X300, but soon became known as Maralinga. The land belonged to the Tjarutja people, though the name did not. Supplied by anthropologists working with Aboriginal people in eastern Australia, it meant “thunder fields”. Beadell’s men set to work. Dragging lengths of railway line behind their Land Rovers, they carved a makeshift airstrip out of the desert in days. A week later, Bristol freighters began arriving from the UK, four days’ flying time away. They were flying in an instant town, designed to house 2000 servicemen and destined to sit in the midst of a fenced-off area the size of England. The main streets of the town sported signs such as London Road, Belfast Street and Durham Crescent. There was a post office, a swimming pool, a chapel, a hospital, even a cinema that screened the latest films from home. There were no women, but there were barbers, a football pitch, beer gardens, repair garages, laboratories, workshops, a parade ground and a VIP dining room boasting a grand piano. On hot nights, it was wheeled outside, and fine claret and cigars and Chopin soothed tired officers under the light of the Southern Cross. The hub of communications with the outside world was the 3.5 kilometre long bitumen airstrip that doubled as a cricket pitch, the world’s largest. The entrance to the terminal was planted with pink and white oleanders, compliments of the gardens of southern England. But Maralinga was no holiday camp. New arrivals were greeted with talk of the need for caution and briefed to steer clear of the huge dumping pit on the edge of town, called the Graveyard. There was also the Dirty Road, trailing 16 kilometres north from the town to ground zero. There, at the edge of the Great Victoria Desert, all sorts of nuclear experiments went on for a decade. Seven big bombs were exploded there, together with a top-secret program of 550 experiments known as the Minor Trials. It was here that Britain and Australia lost their nuclear innocence. The basic details of Maralinga are now pretty well known. Fifty years ago, Britain won membership in the exclusive club of nuclear powers by firing off A-bombs on the Monte Bello islands, off the north-western coast of Australia. Shortly afterwards, the top-secret quest to keep up with the United States and the Soviet Union moved to Maralinga. The official story is that the site was uninhabited and blessed with good weather and near-perfect security conditions. Unhindered by man or nature, the British and their loyal Australian partners reckoned it an excellent location for putting into practice the fantastic vision first defined in secret by Clement Attlee’s Labour Government in 1946. “We have got to have this thing over here whatever it costs, and with a bloody Union Jack flying on top of it,” foreign secretary Ernest Bevin told Whitehall officials after the Americans refused to proceed with a joint nuclear project. The Labour Cabinet decreed that 15 nuclear weapons a year should be built. The target was a massive arsenal; since 25 bombs would be needed to “knock out” Britain, Air Marshal Lord Tedder explained in 1947, the Soviet Union, which was 40 times the size of Britain, could only suffer knock out with 1000 bombs. This was the impetus behind Maralinga. The stakes were high, the game plan was grand, the results mixed, sometimes macabre. Official versions of events, past and present, consistently gloss over the dirty ironies. The truth is that Britain and Australia’s joint nuclear coming of age was fraught. And it is by no means over. It was a time when things much worse than accidental “friendly fire” happened. British, Australian and New Zealand servicemen were deliberately and repeatedly exposed to nuclear hazard. Dressed only in boots and shorts and using scrubbing brushes and buckets filled with detergent, they were instructed to strip and service and clean radioactive aircraft and other equipment. Wearing gumboots and suits made variously of rubber, wool and cotton, they were ordered to walk, crawl or drive through places where Hiroshima-size bombs had hours before roasted the saltbush and red desert sand into three-inch thick glass, called “bomb glaze”. The dead were subject to experimentation as well. After a cloud of strontium-90 drifted towards Adelaide following a detonation in 1958, the bodies of deceased Australians, especially of young children and still-born babies, were secretly harvested. Their ashed bones were analysed in laboratories in Adelaide, Melbourne and, in Britain, Aberdeen, Liverpool and London. The body snatching was done in the name of public safety and without the consent of parents, in violation of the code of ethics drawn up at Nuremberg after the Second World War. According to new findings by Dundee researcher Sue Rabbitt Roff, who specialises in nuclear health issues, there were in fact at least two overlapping programs of this sort. Project Sunshine was initially championed by the Atomic Energy Commission in the US and co-ordinated by the UN before being handed over to the Commonwealth X-Ray and Radium Laboratory and the Australian Atomic Energy Commission. The second was larger and Australian-directed. It lasted from 1957 to around 1980 and again involved analysing the ashes of many thousands of hearts and thyroid glands and limbs. The families of the deceased were never informed. Five decades after entering service, the thousands of British and Australian men who have survived Maralinga (more than a quarter of them are now dead) feel hurt and humiliated. They have no medals to pass on to their grandchildren, no letters of praise or apology from Tony Blair or John Howard, no war-time veterans’ privileges. What they do have are anecdotes about unusual clusters of multiple myelomas. Hip and spine deformities. Teeth that are falling out. Poor eyesight. Bleeding bowels. Post-traumatic anxiety and depression. And perhaps up to a quarter of them, according to preliminary data collected by the New Zealand government, have disabled offspring. It is harsh reward for the loyalty shown by the men who served at Maralinga. They sang theme songs such as Pining for the Mushroom Cloud. They appeared willing to do whatever their officers commanded — fly a bomber through a deadly nuclear cloud, even — which perhaps explains why there were no whistleblowers at the time. But records show that the servicemen’s quiet loyalty was artificially produced. Maralinga was a secret military state within a state. Officers and administrators and scientists were sworn to secrecy. Things were not called by their proper names. Dangerous tools were given innocuous names, such as “featherbeds” and “water lilies”. Deadly experiments were described as “assessment tests” and “experimental programs”. Officers were kept deliberately distant from other ranks. Mateship was actively discouraged, which is why many servicemen couldn’t wait to get shot of the place. Those who saw worrying things were threatened with court martial if they spoke about them. Plainclothes intelligence officers, eavesdropping in the coffee shops of Adelaide, warned those on leave to keep their traps shut. There was much spin, too. Documentaries such as the Ministry of Supply’s Operation Hurricane (1954) spoke about the bomb program as “another triumph for Britain”. Press releases were issued even when their wording was starkly at odds with the facts. A small handful of journalists were fed favourable stories, but most were kept well clear of the whole operation. The non-reporting of the dumping of radioactive sludge into urban sewerage systems was minor compared with the organised silence about the most bizarre experiments, such as Operation Lighthouse, details of which are described in a top-secret document unearthed only two years ago in a garden shed in Perth. Conceived in early October 1958, it was a British plan to place around 800 troops, wrapped in various types of experimental blankets, in shallow trenches upwind from four different nuclear explosions. This was fantasy, luckily. Under pressure from test-ban negotiations in Geneva, the plan was dropped. Other events that would today bring governments down went unreported. Maralinga, like all cutting-edge experiments in technical modernisation, was plagued by what are today called “normal accidents”. The huge nuclear plume that sheared off unexpectedly from the third Maralinga bomb was an example. Code-named Kite, it was a three-kiloton drop on the afternoon of October 11, 1958. Part of its strontium-90 cloud drifted out of control, southwards, over the sleeping city of Adelaide, whose population was 518,000 at the time. 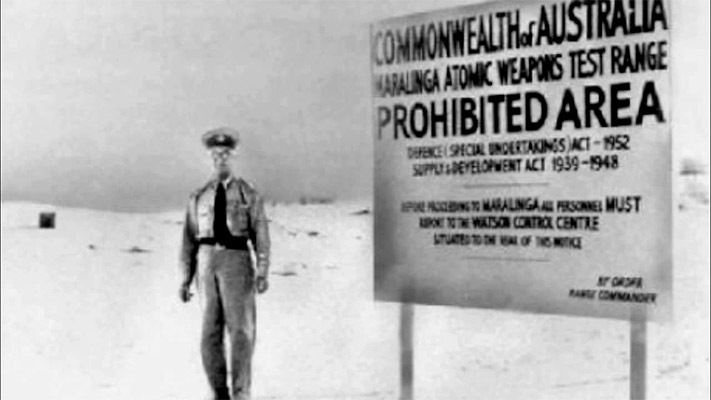 About 20,000 British and Australian servicemen participated in the tests at Maralinga. Tens of thousands more women and men (my father was among them) provided various services in support. Those who entered Maralinga knew little of the risks that awaited them there. The little bridge they crossed on the oleander-lined path leading from the airfield to the terminal was called the Bridge of Sighs. Last rites — a sigh of trepidation by those arriving; a sigh of relief by those departing — were often performed on that spot. Many still remember it well, but they now have different sighs, this time caused by the illnesses that cripple their bodies. In Australia, the Report of the Review of Veterans’ Entitlements has just been released. A victory for decency and common sense, the report acknowledges that what took place at Maralinga was historically unprecedented. Although noting that these were not combat conditions, it goes on to admit that there was indeed “potential” hazardous exposure of the veterans in general, and that no doubt many individuals were so exposed. It recommends that veterans be liberated from having to prove in a court of law that their service made them sick; henceforth, the state should have to prove that it did not expose its soldiers to unusual dangers. All Australian atomic test veterans who are ill with cancer, the review concludes, should be entitled as of right to a disability pension and to fast-track treatment through the state healthcare system for the remainder of their shortening lives. As the site where seven large bombs were exploded — from towers, by air drop and balloon — Maralinga enabled Britain’s then Prime Minister Harold Macmillan to seize what he called “the great prize” that three Prime Ministers before him had striven for. Britain was finally in the nuclear club, just in the nick of time before the 1963 Partial Test Ban Treaty. But if membership had its privileges, it also had its costs: Britain became hostage to the nuclear geopolitics of the Cold War, and more recently to the “nuclear anarchy” that now threatens the world. More than 40 states and untold numbers of non-state groups now potentially or actually have access to nuclear weapons. In other words, Britain’s weapons of mass destruction have spawned; so much for deterrence. British Defence Secretary Geoff Hoon last year confirmed that he is “absolutely confident, in the right conditions, we would be willing to use our nuclear weapons”. The Blair government is meanwhile spending £2 billion ($A5 billion) “modernising” the atomic weapons establishment at Aldermaston, where nuclear warheads are designed. The Pentagon has flagged a forthcoming “nuclear posture review”, a process that will undoubtedly have repercussions for its good-buddy allies Australia and Britain. The technique of developing “low-yield”, “tactical” or “battlefield” nuclear weapons — in effect, their miniaturisation — was first dreamt up at Maralinga in what were known as the “Minor Trials”. In these experiments, the “accidents” and “dirty” effects that might be expected to follow the more flexible use of low-yield weapons were carefully recorded. These trials were top-secret. Journalists and the public knew nothing of them. The Australian Government grew nervous, but continued to play the tune it was paid to play. The trials were not detectable by recording acoustic waves or radio or seismic signals, which was lucky because they were contrary to a memorandum of agreement: on October 31, 1958, at the Conference on the Discontinuance of Nuclear Weapon Tests in Geneva, the US and the UK began a one-year testing moratorium. The Soviet Union joined on November 3, after firing off its last bomb. Documents cited by Lorna Arnold, official historian of the major minor trials, show that instructions were sent to Maralinga that “all firings involving radioactive materials must cease by midnight on October 31”. The instructions were ignored. “We are changing the name,” chief scientist Sir William Penney informed Britain’s Foreign Office, “in order to prevent the possible interpretation that they are very small nuclear explosions”. The minor trials thus became “assessment tests”; by late 1959 they had become “the Maralinga Experimental Program”. The trials continued until May 1963, and consumed several tonnes of uranium and more than 20 kilograms of plutonium. They also vomited plumes of contamination across the desert landscape. There were methods in the madness. Some of the experiments (the Kittens) were designed to develop and improve the efficiency and effectiveness of “initiators”, the device within a nuclear weapon that produces a flood of neutrons that in turn sparks an almighty chain reaction within the fissile material. Anticipating the rise of mini-nukes technology now under consideration by the Bush administration, the aim was to produce better (more controllable and cost-efficient) bangs. The experiments used advanced-level sensors and various lethal materials, including radioactive polonium, and the firings in the desert were said to be so “safe for certain” that at one point before Maralinga active consideration was given to an alternative site near Wick, in northern Scotland. It’s a good thing the Scots were spared. The initiator experiments were mixed up with another set of trials (“Tims” and “Rats”) that were higher up the scale of recklessness. They involved detonating explosions inside the shells of mock nuclear weapons stuffed full of what has been described (by Lorna Arnold) as natural uranium that was “slightly radioactive” but “too low to be hazardous”. The purpose was to track (using sophisticated high-speed photography and gamma-ray detectors that took inside-out X-rays) both the shockwaves within the shells and the subsequent scattering of uranium materials across the desert. But it was the Vixen minor trials that had the major long-term consequences. Later described as “safety experiments”, they involved the controlled fooling around with nuclear materials under risky conditions. Nuclear weapons had to be both transportable and capable of being stockpiled, which implied some probability of accidental damage to warheads. The researchers wanted to know how and when they would catch fire, and what would happen when they did. Would radioactive and toxic materials remain mainly within the debris, or instead be carried downwind? How far? Providing answers to such questions was the preoccupation of the Vixen A trials. The Vixen B trials fiddled around with the explosive materials within actual nuclear warheads. What would happen if something caused an explosion within the warhead during its manufacture, storage or transportation? Needless to say, answering this question by setting off explosions within a loaded warhead produced chain reactions — and the deliberate scattering of dozens of plumes of plutonium debris across hundreds of kilometres of the desert. All this organised recklessness was quietly monitored by the Australian Weapons Tests Safety Committee (AWTSC). Being a pushover, it did nothing. Half a century after the experiments at Maralinga began, and 40 years after they ended, the site still has not been cleaned up to the satisfaction of the key stakeholders, the Tjarutja people. There have been eight clean-up attempts, all of them botched or bungled. Among the first was Operation Brumby in 1967, a quick brooms-around-the-toilet-floor effort by British army engineers that scattered and left behind a great deal of radioactive material. The most recent has just finished. The Federal Government appointed Australian Construction Services (soon taken over by the firm Gutteridge Haskins and Davey) as project manager on the $107 million contract to restore the site. According to Science Minister Peter McGauran, the company’s work has been a resounding success. A recent report from the Maralinga Rehabilitation Technical Advisory Committee (MARTAC) talks of “world’s-best practice”. Visitors to Maralinga are now greeted with striking images of burial trenches the size of the MCG, five storeys deep, and of the modified street sweeper used to brush clean 50 acres of the limestone plain. Peter Burns, director of the Environmental Protection and Health branch of ARPANSA, summed up the mood in Canberra by saying he’d now be happy to host a barbecue in what was once the Maralinga forward zone. But not everyone is convinced. The present Maralinga site manager, Steve Sheppard, says he’d not go kicking a football around ground zero. Alan Parkinson, an experienced nuclear engineer who was the Government’s representative responsible for overseeing the bulk of the clean-up, is most unhappy. He was stood down in 1998 after questioning the clean-up contract (which contained no clear statement of what had to be achieved) and disagreeing with the decision to abandon the vitrification method of clean-up, which would have melted nuclear rubbish, sand and rock safely in a hard, black, glass-like case designed to last well beyond the half-life of plutonium. The vitrification method was abandoned by MARTAC three-quarters of the way through the project, in favour of the much cheaper trench-method. Most of the waste — including broken-up vitrified material — was then buried in unlined pits covered with just three metres of clean soil. The rest was left on the desert surface. As a result, an area the size of metropolitan London — 300 square kilometres — remains infected with lethal plutonium that will stay active for a quarter of a million years. The Maralinga area is Tjarutja land, or was before it was snatched from them and poisoned. It is likely that sometime this year the land will be formally offered back to them. But the Tjarutja have concerns of their own. The whole area, many of them say, is “mamu country” — a gravesite frequented by a lot of living-dead spirits that have the appearance of grotesquely shaped humans with long, sharp front teeth. In fact, the area was far from vacant. A labyrinth of criss-crossing dreamtime tracks connected the Tjarutja to their ancestors, their stories, their living community. The Tjarutja showed no signs of deprivation in an environment in which Europeans couldn’t last longer than a few days without help. Early Europeans who encountered them noted their nomadic qualities, their love of walking great distances through a magical garden of spirits, to meet relatives, to sample new food, to visit their favourite rock holes, to attend corroborees. Menaul went on to say “we never saw any” Aborigines in the area. But some servicemen did. Two hundred of them were threatened with court martial or execution after taking photographs of an Aboriginal family they spotted camping in a radioactive crater. There were some conscience-driven civil servants in both Australia and Britain who reminded the Maralinga authorities to care for the welfare of the Aborigines, all the while worrying about what journalists might say if they got their hands on the story (they didn’t). And there was a single patrol officer, Walter MacDougall, whose impossible job of monitoring the movements of the Aborigines and quarantining them in settlements, sometimes against their will, led him to conclude, in an unpublished letter, that this was “a first-class scandal. We might as well declare war on them”. Australia, of course, agreed to do Britain’s dirty work. Its troops suffered, felt humiliation, and died. Those injustices and defeats will not be forgotten, and the fact that it all seemed worthless, that Australia got little or nothing out of the unequal relationship, suggests that Maralinga is a second Gallipoli in Anglo-Australian relations. The analogy stretches far, but it has one limit: this time a dogged people with immense patience, a people who are not interested in finding their identity in a medal, have the power to keep the Maralinga story alive — even to convince those who have wronged them to say sorry. Dr Archie Barton, a senior member of the Tjarutja people, is a fine man of few words. Twenty years ago, he helped found a new and viable community called Oak Valley, 110 kilometres north-west of ground zero, as close as his people want to be. Ten years ago, he was part of a delegation that travelled to London to seek compensation from the government of John Major, and to pop a carefully wrapped gift from Maralinga upon the table of a parliamentary committee: a little bag of plutonium soil.